Each year the Incorporated Militia of Upper Canada returns to Sackets Harbor, New York to join our American friends on the Sackets Harbor Battlefield. This year the Royal navy, The Glengarry Light Infantry and the Grenville Militia joined us! Once again Connie Barone and her staff and volunteers treated us as old and good friends! The Owl also was able to attend. On Sunday a contingent of IMUC was sent into town to round up some missing privates who had taken too long at breakfast. The one that we were able to apprehend and march back to camp was turned in by his wife! 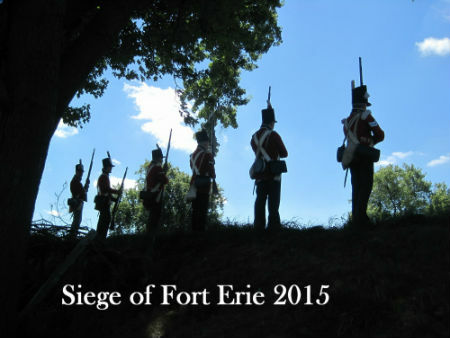 The bicentennial of the Siege of Fort Erie has passed but enthusiasm and participation are still going strong. Drill, three battle scenarios, a night siege and tour and our turn to go over the wall made for a busy busy weekend but worth all the effort!! Thank you to the staff and site for hosting the 30th siege annual weekend ! Our Sarah Brown is responsible for shooting the evening battle and explosion pictures. All shot under difficult lighting conditions for sure! More pictures will be added as they become available from our other IMUC/Campfollower cameras! 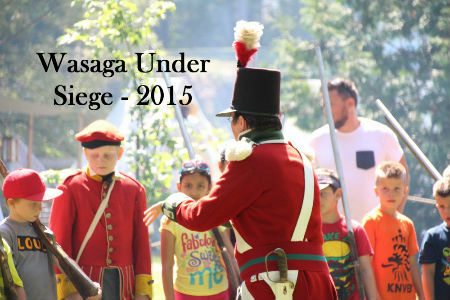 Once again Nancy Island in Wasaga Beach was home to a group of 1812 enthusiasts. The Friends of Nancy Island with a little help from Dave Brunelle invited The Canadian Volunteers, The US 22nd, The Royal Newfoundland Regiment (Bolger, Armstrong, Skinner Companies), The Royal Artillery, The Nancy Gun Crew, The Royal Navy and the Incorporated Militia of Upper Canada to attend a weekend of demonstrations of military and campaign life. The Island once again had cannon firings, musket demonstrations, the Candy Cannon, Native singing, naval and artillery displays. Despite the record temperatures and humidity, everyone had a great time!